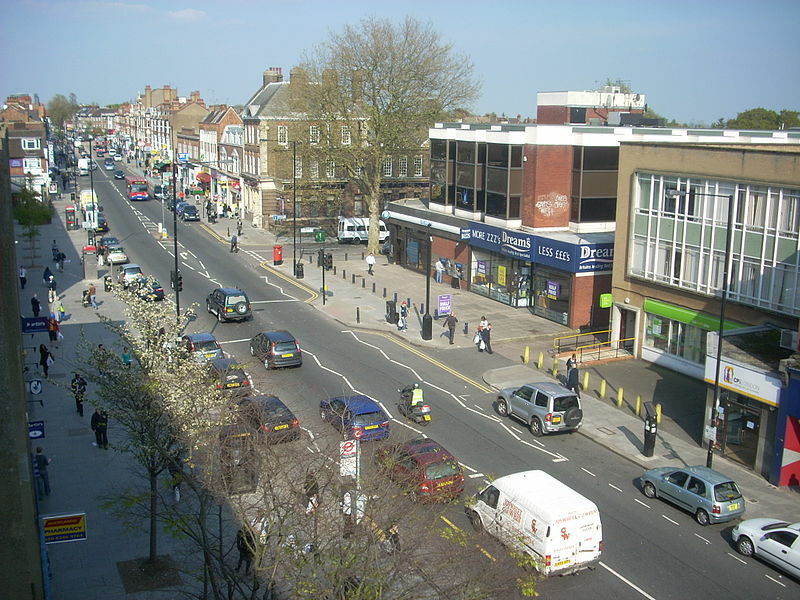 Finchley is a districtin Barnetin north London, England. Finchley is on high ground, about 11 km (6.8 mi) north of Charing Cross. It formed an ancient parish in the county of Middlesex, becoming a municipal borough in 1933, and has formed part of Greater London since 1965. It is predominantly a residential suburb, with three town centres. Finchley probably means Finch’s clearing or finches’ clearing in late Anglo-Saxon; the name was first recorded in the early 13th century. Finchley is not recorded in the Domesday book, but by the 11th century its lands were already included in those of the Bishop of London. In early medieval period the area was sparsely populated woodland. During the 12th and 13th century proper farming began, and by the 15th and 16th century the woods on the eastern side of the parish were cleared to form Finchley Common. The medieval Great North Road, which ran through the common, was notorious for Highwaymen until the early 19th century. In the 1270s the parish church of St Mary is first recorded. The settlement at Church End grow up around it. Near the northern gate to the Bishop of London’s park the hamlet of East End, later East Finchley had begun to develop by 1365. The Edgware, Highgate and London Railway (later the Great Northern Railway) reached Finchley in 1867. The route ran from Finsbury Park via Finchley to Edgware. The High Barne branch opened from Finchley in 1872.